This simple heavy duty, custom labeling system is designed to apply labels to the fronts and backs, or full wrap around for 1 or 5 gallon buckets and pails. 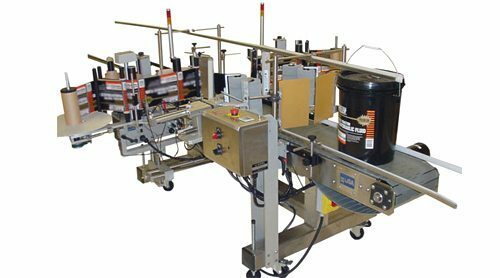 Quadrel’s pail labeling system features a rubber belt conveyor, stainless steel construction and rotary actuating vacuum pads to apply the labels to the leading edge, sides and trailing edge of 1 or 5 gallon buckets or pails. The system is hand loaded and achieves a production rate of 15-20 products per minute.